Seat’s second-generation Alhambra was a welcome addition to the full-sized MPV market, and it still represents a good choice for those who want to go on holiday with the family or an extended group. The body of this Alhambra vehicle is large and cavernous; the interior itself boasts a practicality that will please families looking for a cheap holiday vehicle. The seats can be folded and arranged in many configurations, which helps those who need to adjust the space to better suit their families and their luggage. It’s also pretty easy to move and adjust the seats around, so you don’t have to worry about exerting too much energy moving everything. Unlike comparable vehicles, this vehicle can comfortably accommodate adults in the third row of seats. There are also additional cabin storage options to easily store luggage and other necessities while on the road. The overall ride quality makes this a great vehicle for travelling families; it travels well over a good variety of surfaces. The seats are also supportive and keep occupants steadied over bumpier roads. This Alhambra vehicle also isolates sound well, keeping most disturbing sounds away from the cabin. Drivers will like the performance of the 2.0-litre diesel engine better than other versions. It’s a great performing vehicle, with comfortable handling and a satisfying performance all around. As a family car, it makes a great rental. 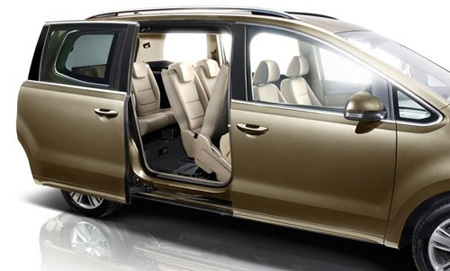 You have the ability to adjust the seats in any configuration you need and the practical interior is great for those who worry about not having enough space to accommodate the family on a road holiday. It makes for a great everyday vehicle. There are plenty of options when you need to rent a 7 seater on the market, but few as practical and spacious as this. The Seat Alhambra 2.0 TDI makes an excellent choice for rental with its great performance specs, large space and overall comfort factor.